Marrocchi, Y. ; Euverte, R. ; Villeneuve, J. ; Batanova, V. ; Welsch, B. ; Ferrière, L. ; Jacquet, E.
We have studied porphyritic olivine-rich chondrules of the carbonaceous chondrite Kaba (CV3) by combined high-resolution X-ray mapping, quantitative electron microprobe analyses, and oxygen isotopic analyses via secondary ion mass spectrometry. These chondrules contain smaller inner-chondrule olivine grains characterized by low refractory element (Ca, Al, Ti) contents, and larger outer-chondrule olivine crystals that are enriched in refractory elements and show complex Ti and Al oscillatory zonings. Our O isotopic survey revealed that many of the inner-chondrule olivines are 16O-richer than the relatively isotopically uniform outer-chondrule olivines. Inner-chondrule olivine crystals—only a minority of which may be derived from earlier generations of chondrules—are likely mostly inherited from nebular condensates similar to AOAs, as they share similar isotopic and chemical features and are thus interpreted as relict grains. Still, being 16O-poorer than most AOAs, they may have experienced significant exchange with a 16O-poor reservoir prior to chondrule formation (even if to a lesser degree than relicts in CM2 and ungrouped C2 chondrites). Subsequent incomplete melting of the relict grains produced Ca-Al-Ti-rich melts that engulfed the remaining relict olivine grains. 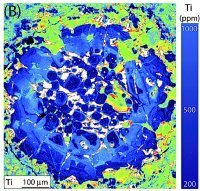 The complex Ti and Al zoning patterns in outer chondrule (host) olivines, in particular the systematic dilution near the margin, seem to reflect gas-melt interactions (with e.g. SiO (g), Mg (g)) which also buffered the O isotopic composition of chondrule hosts. Together, these results demonstrate that important episodes of recycling of nebular condensates occurred in the solar protoplanetary disk.